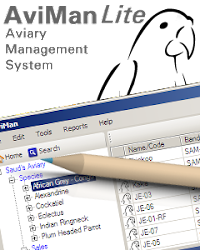 This is my African Grey Parrot breeding log. I have 6 pairs. First, photo of each pair, a brief history and the pair number. I will post updates with reference to these pair numbers periodically. Status: The pair laid 3 eggs in the first clutch. All fertile, hatched 2 chicks, 1 fully developed failed to hatch. I removed the box after the first clutch to give them a rest. Gave them the box again in September 2010. However they have not laid again since. I now realize that removing the box may have been a mistake. Greys are known to skip a year occasionally. 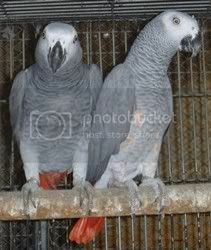 Hoping that they will lay again in 2012. Everything seems normal with the pair except, no eggs. Status:The hen in this pair is semi-tame. Never bites or growls but does not like being handled. 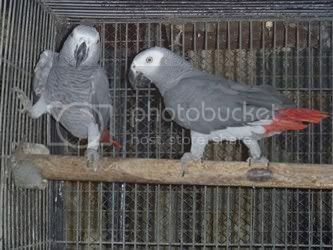 I have had her as a pet since March 2002 when she was about 6 months. She started to pluck her chest feathers a couple years ago. I decided to pair her up. After years of loneliness she was too eager to breed and laid within 6 months. The male however was wild and was not comfortable in his new environment to do the job properly. The eggs were therefore infertile. 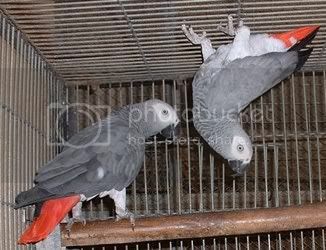 I removed the eggs but she laid 4 clutches of 2 eggs each back to back between 30/11/2010 and 20/3/2011. All infertile. I remove the box because I was worried about her health. Have given the box again in August 2011. Male is looking very confident now. Hoping for better results this time. Status: This pair has laid 2 clutches so far. The first one starting 19/8/2011 had 2 eggs. One egg was dented which I removed and repaired. The dented egg turned out to be fertile and the other was infertile. The chick seemed to be developing normally. When I checked the box around hatch time, the fertile egg had disappeared! I am not sure if it was eaten or thrown out. Either way there was no trace left behind. The second clutch was started soon after on 24/10/2011. This time there were 3 eggs. 2 turned out to be infertile, the third was early DIS (dead in shell). On a positive note none of the eggs were broken or eaten and the pair incubated them very well (cctv). I have discussed this with @sab and he suggested some nutritional deficiency and/or minor salmonella infection for infertility and DIS. I have recently started using Maximix supplement so that should take care of the nutritional deficiency (if any). I have also given the pair a 5 day course of enrofloxacin to get rid of any infections that might be hiding in there. Hoping for better results in the next clutch. Status: This pair took longer than others to settle down. The male did not appear to be very active. He would always hold the pose shown in the photograph above with absolutely no expressions. I was not very hopeful and decided to give this hen a new male in Jul 2011 after 1 year had passed. The new male was a nervous bird and I realized it would take a lot of time to settle in. After about a month, I decided to give the old male a second chance. This time I decided to observe them with a cctv camera. The male was his old inactive self when I was around the cage but on the cctv camera he was very active, feeding the hen and looking bonded. My faith in him was renewed. 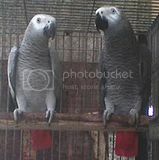 In Sep 2011 the pair visited the box for the first time. They worked the box for a couple of months and on 8/12/2011 laid their first egg. Let's see how it goes. Status: The male in this pair is young. Probably around 3 years of age. I picked him up because he has red feathers on his back. I have found red-factor males to be rarer than females. The hen has red feathers on her chest. She has started working the box. If she lays in the near future, I am not expecting the eggs to be fertile. The male has not been DNA's yet. I have been a little lazy and perhaps also appreciative of the judgement of the person who I got it from. The DNA has only confirmed his visual judgement in 8 other birds. Status: Hen is red factor with red feathers on both chest and back. She is still a very nervous bird even though she has improved a lot. 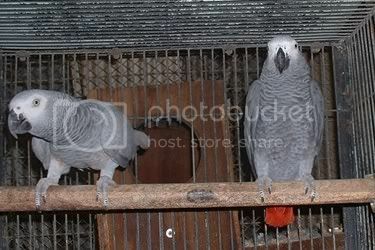 This pair was given the box recently on 20/11/2011. They have already started visiting the box. May still take 6 months to a year to lay. The male here is also not DNA'd. I don't want to traumatize them, will get it done after the season. 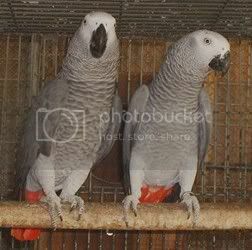 how do you know the different between male and female African Grey Parrot.